Home Amihan La Niña LPA Northeast Monsoon PAG-ASA Tail-End of a Cold Front Tropical Depression Tropical Depression Urduja Weather PAGASA Weather Forecast for TD"URDUJA" as of 5:00 AM today, 19 December 2017. PAGASA Weather Forecast for TD"URDUJA" as of 5:00 AM today, 19 December 2017. PAGASA: Issued at 5:00 AM, 19 December 2017 - "URDUJA" HAS MAINTAINED ITS STRENGTH AS IT APPROACHES THE WESTERN BOUNDARY OF THE PHILIPPINE AREA OF RESPONSIBILITY (PAR). ISSUED AT:11:00 AM, 19 December 2017 - TROPICAL DEPRESSION "URDUJA" IS NOW OUTSIDE THE PHILIPPINE AREA OF RESPONSIBILITY (PAR). Sea travel remains risky over the western seaboard of Palawan due to the surge of Northeast Monsoon. 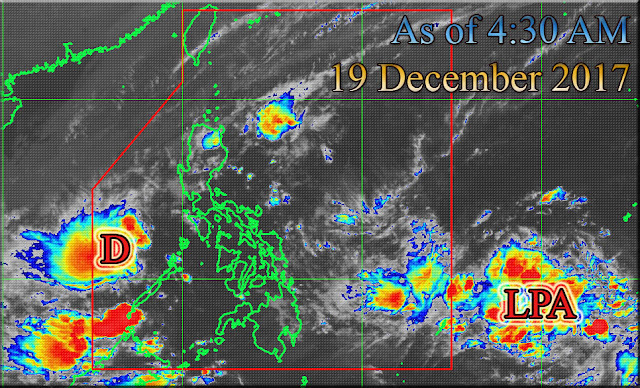 However, the new Low Pressure Area (LPA) has a possibility to enter PAR tomorrow (December 20). NO TROPICAL CYCLONE WARNING SIGNAL as of 5:00 AM today, 19 December 2017.At 4:00 AM today, the center of Tropical Depression "URDUJA" was estimated based on all available data at 240 km West Northwest of Puerto Princesa City, Palawan (10.2 °N, 116.6 °E) with maximum sustained winds of 45 kph near the center and gustiness of up to 60 kph moving West Southwest at 18 kph. Tropical Cyclone Warning Signal No.1 over Palawan has been lifted. However, sea travel remains risky over the western seaboard of Palawan due to the surge of Northeast Monsoon. "Urduja" is expected to exit the PAR this morning or afternoon. DOST-PAGASA Satellite Image thru HIMAWARI-8 as of 4:30 AM, 19 December 2017. Continue Reading: Latest Location of the Low Pressure Area outside the PAR. PAGASA Daily Weather Forecast for 19 December 2017.